How cute are these little packages?? 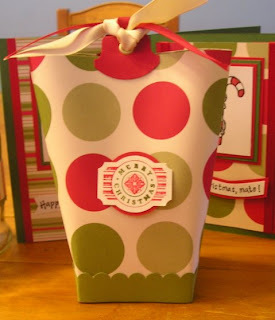 As soon as I saw them I had to know how to make them and I found the instructions here http://www.splitcoaststampers.com/resources/tutorials/boxinabag/. Splitcoast is a great resource for tutorials on all sorts of cute projects. Party Punch a Level 1 Hostess Set. I used Old Olive and Real Red Markers to colour direct to the stamp to achieve a multicoloured image. I then punched it out with the Designer Tag punch and layered it onto a punched circle. These little bags will be perfect for teacher's gifts.